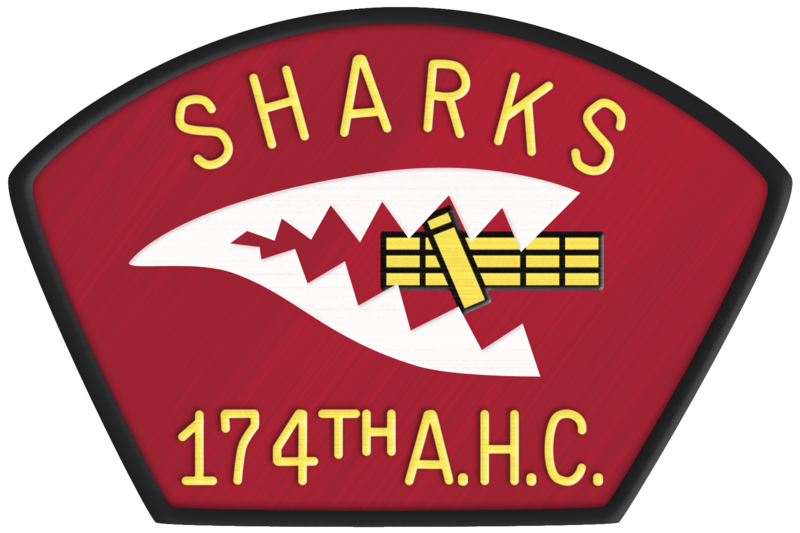 During the first two weeks of February 2015, a group of 174th AHC Association members returned to the places they flew in and out of during their tour in Vietnam. Phill Daneau and his wife Carla, Howard Mo Modjeski and his wife Jane, Dennis Fisher and his Son Jay, Dwight Wise and his wife Susan, Jeff Morris and his wife Maureen Ralph Elliott (Butch) Elliott and his wife Janet plus Fred Taylor, Russell Lay and John Stoddard made the trip. They all had different reasons and different things they wanted to see and they got to see every one of them. The tour was set up by a non-profit company named Vietnam Battlefield Tours out of Texas. Dennis and Fred wanted to find the Orphanage at Quang Tri and they did. Mo and Jeff wanted the find the Leper Colony South of Qui Nhon and they did. Russel and John wanted to see San Juan Hill and they did. Dwight and Phill wanted to get back to Duc Pho. And, it seemed everyone wanted to see where Butch got shot down in Laos, and we all did. The trip included Saigon, Qui Nhon, Lane AAF, Bong Son Bridge, LZ English, Dui Dang, LZ Bronco, Duc pho, LZ Liz, San Juan Hill, Quang Ngai, Tam KY, Chu Lai, Ky Ha, Hoi An, China Beach, Marble Mountain, Da Nang, Camp Eagle, Phu Bai, Citadel, Hue, Khe Sanh, Razorback, Quang Tri, Peace Bridge, LZ Bravo, Lam Son, Lao Bao, the Laotian crash site of Butch Elliott, and Hanoi. It was up by 6AM and dinner by 7PM each of the fourteen days. The following presentation was given at our 2015 Reunion and is a very minor part of some 450 photos. 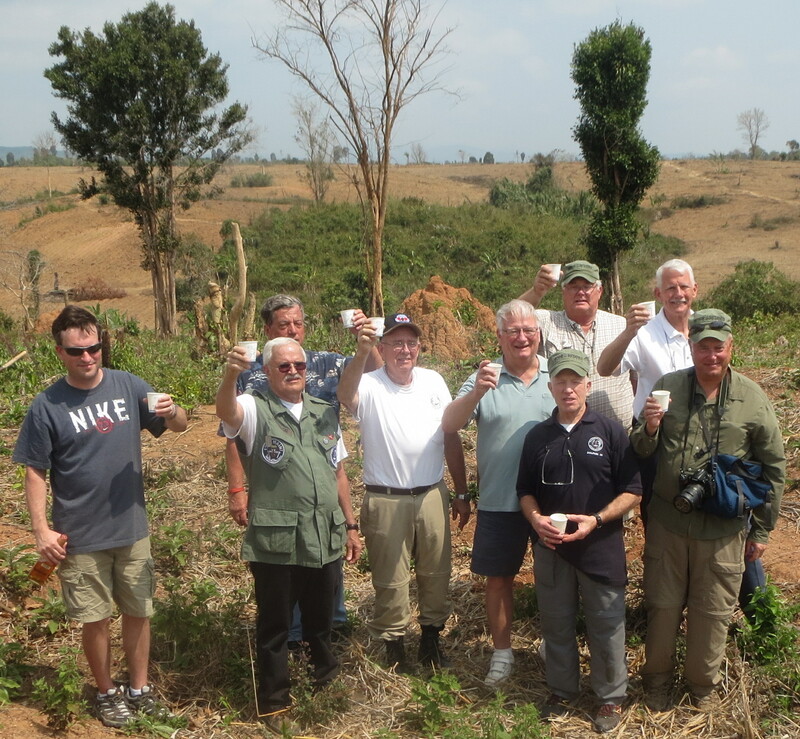 In the photo below, at the location in Laos where Butch was shot down in 1971, he offers the following Johnny Walker Red toast, "To all the soldiers, living and dead from both sides, because we all thought we were doing the right thing." Below the photo there is a link to take you to Butch's slideshow of his return trip to Vietnam. Those in the photo below include, front row left to right: Jay Fisher, Fred Taylor, Butch Elliott, Dennis Fisher, Russel Lay, and John Stoddard. Back left to right: Jeff Morris, Dwight Wise & Mo Modjeski. 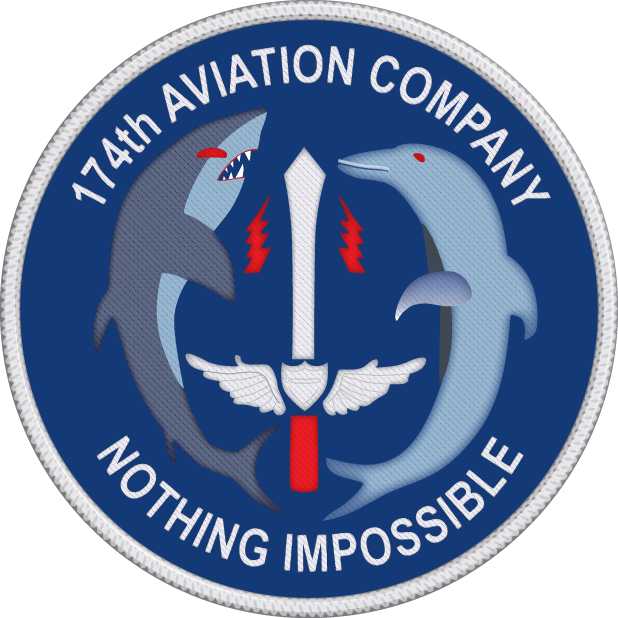 Click on the link below for a PDF copy of Butch's slideshow of the trip that he presented at the 2015 174th Reunion in Ft. Walton Beach, Florida. Note the PDF file is about 18 MB and will take awhile to download. Note in the slideshow above, on slide number 36, it says simply "The story." The story is that of the shoot-down of Dolphin 993 in 1969 and the return to the crash site by Robert Hazen's wife, Judy. The purpose of the trip was to honor her husband Robert as well as the crew and the solders onboard, all of whom died in the crash. Judy also honored her daughter Marcie Hazen who was planning a trip to the crash site of her father, who died the year she was born and whom she had never met. Sadly Marcie died before being able to make the trip. See the entire story by clicking on the link below.